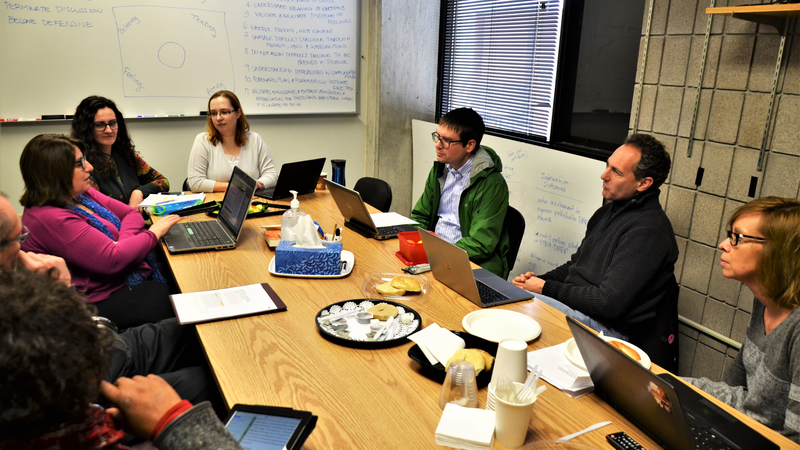 The RIT Science and Mathematics Education Research Collaborative (SMERC) runs a weekly journal club and monthly seminar series, open to all, consulting with faculty interested in incorporating research-based methods and assessment into their classrooms. The College of Engineering Technology (CET) Journal Club meets biweekly on Tuesdays in ROS A252, from 3:30pm - 4:30pm. For more information on joining, contact Mike Eastman at mgeiee@rit.edu. Melissa L. Aikens, Melissa M. Robertson, Sona Sadselia, et al. Arthur C. Graesser, Stephen M. Fiore, Samuel Freiff, et al. Proceedings of the 2012 Physics Education Research Conference, 298-301 (2013). The regular journal club is postponed due to a SMERC Colloquium on the same day. PLOS ONE 13, e0206570 (2018). Owens, M. T. et al. Physical Review Physics Education Research 14, (2018). Phenomenological Study of Teacher Emotions as an Essential Construct of a Liberal Arts College's Signature Pedagogy Using Sense-Making Methodology. Cavanagh, A. J., Argon, O. R., Chen, X., Couch, B., Durham, M., Bobrownicki, A., Hanauer, D. I., Graham, M.J.
Can Engaging in Science Practices Promote Deep Understanding of Them? Dolan, E. L., Elliott, S. L. Henderson, C., Curran-Everett, D., John, K. S., & Ortiz, P.A. Physical Review Special Topics - Physics Education Research 3, (2007). International Journal of Industrial Ergonomics 38, 1028–1037 (2008). Journal Club is cancelled because a special CASTLE Seminar Jan 25, 1-2 pm in Gosnell 1305. Cohen, G. L., Steele, C. M., & Ross, L. D.
Apfelbaum, E. P., Stephens, N. M., & Reagans, R. E.
Pauline M. Ross et al. James E. Russell, et al. Lisa Corwin Auchincloss, et al. Why do women opt out? Sense of belonging and women's representation in mathematics. Do action video games improve perception and cognition? Michelle A. Harris et al. Christina V. Schwarz et al. There will be NO journal club this week. Enjoy the Nvivo Webinar. There will be NO journal club this week due to spring break. Stay safe in the blizzard! Joseph T. Dauer, et al. Do girls really experience more anxiety in mathematics? Keith Rayner, Timothy Slattery, et al. Nicole McNeil, Aaron Weinberg, et al. Bethany Vice Bowling et al. What We Say Is Not What We Do: Effective Evaluation of Faculty Professional Development Programs"
M. Pilar Jimenez-Aleixandre et al.